A few days ago Morticon's new butler was shocked to find a skinned marsupial pelt nailed to the front door of their private residence. It is unclear whether the pelt belonged to a fellow wallaby, but it had been nailed to the door with a four pointed star; a shuriken of sorts. Which leads to believe that this was the work of Kunoichi Corp. While Kunoichi Corp. presents itself as being an honourable and respectable company, the ongoing rivalry between Kunoichi Corp and the SED is no secret. But now it seems that they have decided to attack the SED members on a personal level. On Monday night Kunoichi Corporation held a somewhat impromptu Easter gathering on their company campus grounds. Kunoichi herself came into the Rose Garden to invite all to the holiday celebration. When asked why she had arranged the party on such short notice, she revealed that the Corporation had received an anonymous threat in the form of a mauled manikin which was wearing a sign saying, "Kunoichi Go Home". Worried the event might be disturbed by someone seeking to make good on this grotesque threat, Kunoichi decided to take a clandestine tack and hold the gathering with virtually no notice. Due to the impromptu nature of the party, attendance was low. Among those who came to enjoy the festivities were DTF, local wolf, Darius, local ferret and employee of the Corporation, Nyni, local unicorn fairy, Tzolkin, local felizar, and Than, local lioness cub. Though the affair was not as formal as the original Kunoichi Open House had been meant to be, a good time was had by all. Patch O'Black, local jellicle cat, provided snacks and drinks in abundance, and the youngsters enjoyed dyeing Easter eggs. Corporation members provided live music on traditional Japanese instruments. Hotaru played the koto, a harp-like instrument, to accompany Eiko on the shamisen, which resembles a lute. Listeners were amused when the talented pair spontaneously broke out into a familiar tune: "Stairway to Heaven". Hopefully this modest success will encourage the Kunoichi Corporation to host future public events. Cirro, local feline, was kind enough to share the following pictures he made of events this week in the Rose Garden. Aina's Sorrow: Poor Aina'. She isn't allowed sugary snacks by her boss, Morticon. So when Hotaru takes out a pixie stick she becomes very sad indeed. 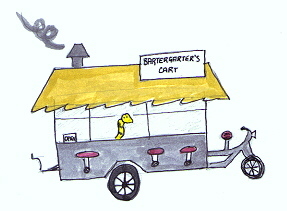 BarterGarter's Cart: BarterGarter visited the Rose Garden and traded all kinds of rare and wondrous things. Have you found yourself low on shinies and find yourself swallowed up in the earth when you try the FUND command? Then just ask Vixie, local vixen, for some money. Turns out our local "cute" fox is one of the richest folks on SpinDizzy. 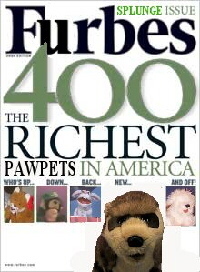 Vixie is one of the 400 richest "pawpets" in America according to Furbes magazine. Vixie is so rich she is on the cover. That's her on the far left. Although Vixie has been discrete about her riches, as opposed to her self proclaimed "cuteness", she does occaisionally share her wealth with those in need. So next time you find yourself at the SpinDizzy Casino with your paycheck in the paws of the Blackjack dealer, give Vixie a call. She may help you out! Patch O'Black Four-Color Kitty: Everybody do the Bunny Hop! 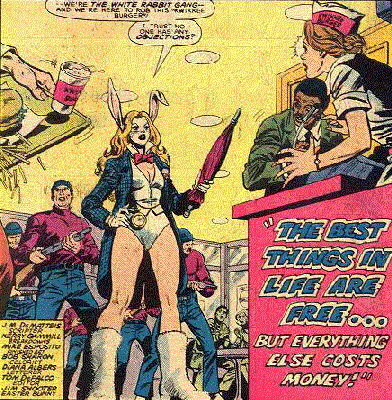 The White Rabbit is...well, to be honest, she is a C-list super-villian. Mind you, on the surface, she has the makings of a really unique lawbreaker. Her theme is, of course, the Alice in Wonderland stories. She also is drop-dead gorgous, which is a plus for any female costumed criminal. Using various Wonderland-styled gadgets, she could have been a contender. She is actually a wealthy young lady, but she becamed bored, and turned to crime for excitement. Some would call her excentric. Most would call her off her nut. Oh, it gets even better. What super-hero hops in to stop this threat? Captain America? Iron Man? No...it's Frog Man! 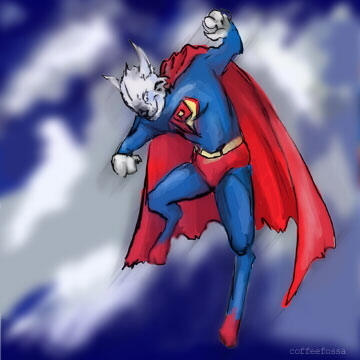 If White Rabbit is a C-list villian, Frog-Man is a D-list hero. He uses a mechanical frog suit (Stop that giggling, or I'm turning this column around and heading home!) to fight crime. Well, more like tries to. He doesn't have the hang of it and ends up more like an out-of-control pinball during an earthquake. Anyway, White Rabbit takes off , leaving her henchmen to deal with Froggy, who manages to take himself out of the picture. Spider-man shows up, helps our poor dweeb of a crime-fighter, but the White Rabbit disappears for a while. Her next outting is an attempt to get revenge on Frog-Man. Well, at least she picked an opponent she could handle. She gets fellow C-list villian, the Warus (another guy in a mechanical suit. Honestly, folks, pick an animal that actually has some sort of advantage in a fight!) So, they go out in front of...the same fast food place as before! They do attract Frog-Man, but they also attract his father, a small-time super-villian by the name of LeapFrog. He built the suit the Frog-Man uses, but for criminal purposes. LeapFrog, however, actually can work the thing and, with the help of Spider-man once more, wraps things up. The White Rabbit was caught when Frog-man clumsly landed on her, by accident. You would think that would be enough for this buxom bunny, but nope! He next plan was originally to rob a bank (At last! She is learning! ), but when she spotted Grizzly and his partner, Gibbon the monkey boy, who were part of a villain group nicknamed by Spider-Man as the "Legion of Losers", she changed her plans and...kidnapped them for ransom! Not only did she try to get the city to pay for the return of a couple of super-villians, they were incompetent super-villians! She asked for a billion dollars. The mayor offered her $2.50. If that wasn't enough, she got captured by Spider-man again, but Spidey wasn't in his usual outfit. Nope, he didn't have his costume available, so he put one together from some sacks he found and captured her as...Bag-Man! A glutton for punishment, her latest caper had her teaming up with a top-notch criminal this time, one by the name of Arcade! Now, this guy has tangled with some of the best and, while not won everytime, has held his own! See, he gets paid to kill folks, but he does it with style by kidnapping them, then having the victim try to stay alive in his killer theme park, Murder World. If they survive, he lets them go. Of course, not many survive. Anyway, these two teamed up against the Black Cat and Wolverine. The deadly duo did alright for themselves for a while, but Black Cat and Wolverine eventually turned the tables on the two. 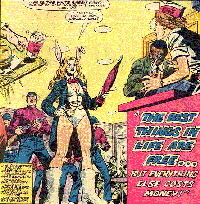 Arcade called the White Rabbit a dumb bunny as the two ended up on an island inhabited by a small tribe of primative people. 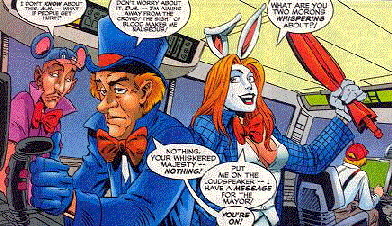 Apparently, the warrior chief took a liking to the White Rabbit, as she was last seen sitting on a throne next to him, as Arcade was hung over a fire, apparently for his insult to the Whte Rabbit. And, thus ends our tale of the White Rabbit! While not the greatest character to ever come from the house that Stan and Jack built, still an entertaining one! Until next week, see you in the funny pages! Q: How do you teach a chicken to lay a colored egg? A: Like with all education, it starts with a detailed less-hen plan. Q: Who hides thousands of little round pellets all over the yard for kids to find? Q: Who hides thousands of pearls all over the yard for Mom to find? Q: Who leaves a snazzy watch for Dad to find somewhere in the yard? A: The Rolex Oyster Perpetual Date Bunny. Q: Who leaves bullet casings, horse apples, and cowboy boot and spur prints all over your yard? Q: Who leaves tobiko all over the yard for anyone to find, hopefully before it goes rancid and stinks up the whole neighborhood? Q: If the real Easter Bunny is Peter Cottontail, who are all his assistants in fursuit? Q: Who has big ears, a fluffy posterior, and leaves dead mice all over the claim for miners to find? Q: Why did the police arrest the Easter Bunny? A: He was carrying a whole basket of grass, along with Reds, Yellows, ..., and giving it to kids. Q: How do otters celebrate Easter? A: They eat tobiko and jellyfish. Q: Who leaves a charred egg in the yard after an outbreak of Scarlet Fever? A: The Velveteen Easter Rabbit. Q: Who do you definitely not want to see in your yard on Easter? A: The Black Rabbit of Inle'. Q: Who lays an egg in the throat of every good little girl and boy, that will eventually hatch out of their chest? May the Easter Ferret fail to catch the Easter Bunny again, so he can leave lots of eggs. Hi all, Ba'ar here with your Spindizzy Action news Survey for the week. This one's for you bookworms out there. What was the last book you read? Borris Gruffs, "Thud, by Terry Pratchett." Royce churrs, "Letsee... Last book I finished was Mrs. Frisby and the Rats of Nimh, right now I'm reading The Worst Hard Time, by Timothy Egan." 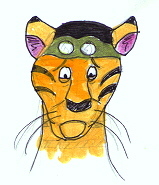 Nyni cutely says, "Been reading over a book my dad wrote, called Camp Black Oak, which he just got back from an editor. 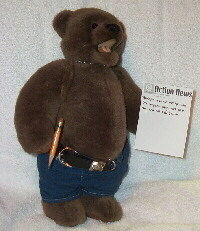 He hopes to get it published sometime!" Gilead chirps, "Protocols for Flow Cytometry." Cirro intones, "The Big Over Easy by Jasper Fforde." Nimble thinks it would be the phone book for hir, but sie didn't complete that one. BarterGarter hisses, "Harry Potter and the Half Blood Prince." DTF ponders "Completely? Railroad Signaling by Brian Solomon. Partially... Building a Circular Sawmill by Richard Buxton. Ceredwyn says "'A History of Western Society' by McKay, Hill and Buckler." Saliah shyly purrs, "Diamond Age by Neal Stephenson... but that was a while back." Aushae says, "Last book read: Spider Robinson - Callahan's Key (again, again, again...)"
Eliahn says, "Survey Answer: Dan Simmons: Hyperion." Nikon says softly, "Cause I haven't read a dead tree book in years, other then my textbooks. And the last Book I read digitally was A Fox in the Works: Year 5"
Argon says, "The instruction manual to a Broadway Limited DCC sound equipped E7." 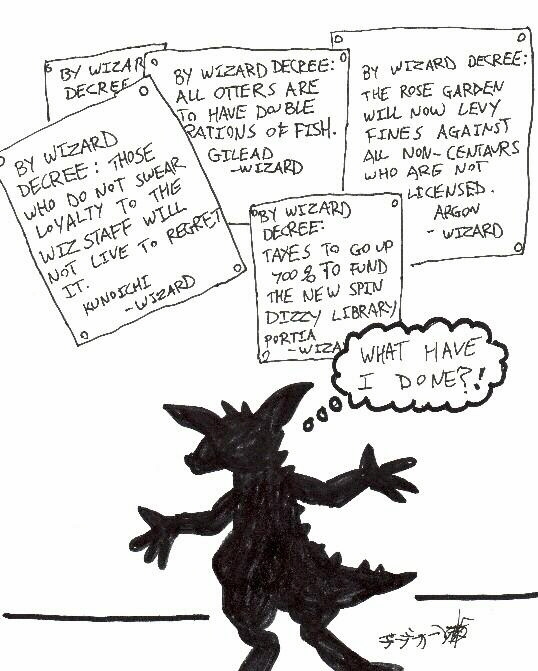 The wizstaff's April Fools joke backfires!